Oh goodness, GrannyJu, it sounds like you had quite the time of it! It's sad how rampant this stuff runs in the pet stores. It's just good you caught the infection since it had a different presentation than usual! I'm glad they're doing better now. Also, I've been checking them every day, thank goodness, or else I would have completely missed Amelia's spot on her side. Now that she has it too, I've been doing even more thorough checks than usual, just in case. It breaks my heart to say this, but after a long battle with various illnesses, Sofia crossed over the rainbow bridge last night. You have our sympathy. I am so sorry you lost her. Thank you all. 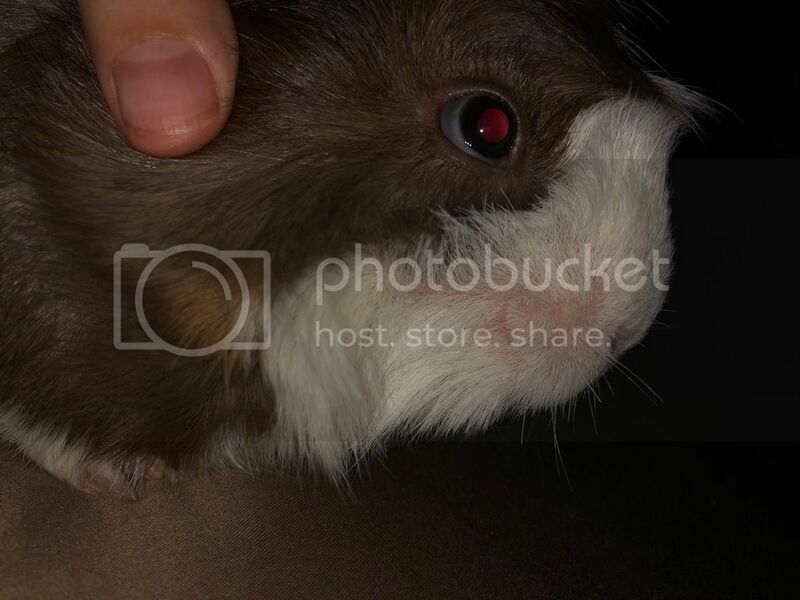 One of the reasons pet store guinea pigs are not recommended...not long after I brought her home, we found out she had fungus, mites, and a respiratory infection. Luckily, she hadn't had any contact with the others, so we kept her isolated, treated her, and finally got the all-clear check-up from the vet. She was good for a while, but the vet still had us giving her meds to make sure everything was killed off. It's only been a short time since she has been off the medications and finally allowed around the others. Unfortunately, the medicine took quite a toll on her tiny little body. The vet believes the medicine killed off her 'good bacteria' and allowed bad, anaerobic bacteria to overproduce in her stomach. They release toxins and lead to a very sudden death. 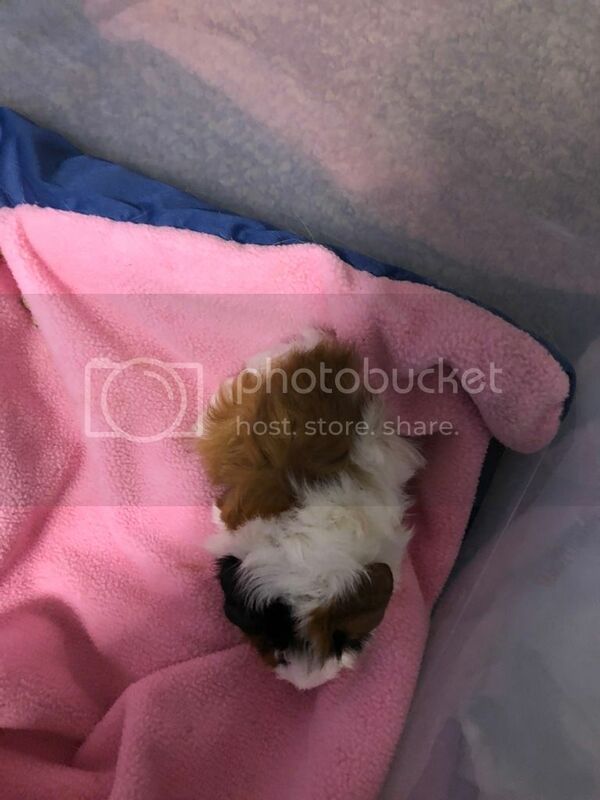 He is going to perform a necropsy for my peace of mind, especially since she seemed pretty healthy yesterday, but he said this happens with guinea pigs (especially young ones) that are really sick and have required a lot of medication. Of course, this makes me feel like a guilty momma because I'm the one who was treating her, even though I was extremely careful about giving appropriate doses. I also know she would have died from her various illnesses without the medication. I am thankful that it was a quick and seemingly painless death. Especially on the farm, I have watched animals die extremely slowly and painfully, so I am thankful she didn't have to go through that. It's just a very sad, emotional day. On another note, I stopped by the pet store I got her from the other day and told them what the vet had diagnosed her with (I live a ways from the store and this was the first opportunity I had to go there since I usually work until after they're closed). They refused that any fungus, mites, or infections came from them, so I asked to hold one of the guinea pigs that they still had (they had 5 in that cage). Sure enough, there was a big (obvious) spot of fungus on her shoulder and other bald patches. At first, the pet store tried to say it was from being bit, but I insisted they take a closer look. Finally, they tossed that guinea pig into a cage with another 'sick' guinea pig and said it was isolated and didn't mean they ALL had it. It is absolutely sickening the lack of care these poor babies are receiving. This is part of the reason we encourage adoption and tell people to avoid pet stores. 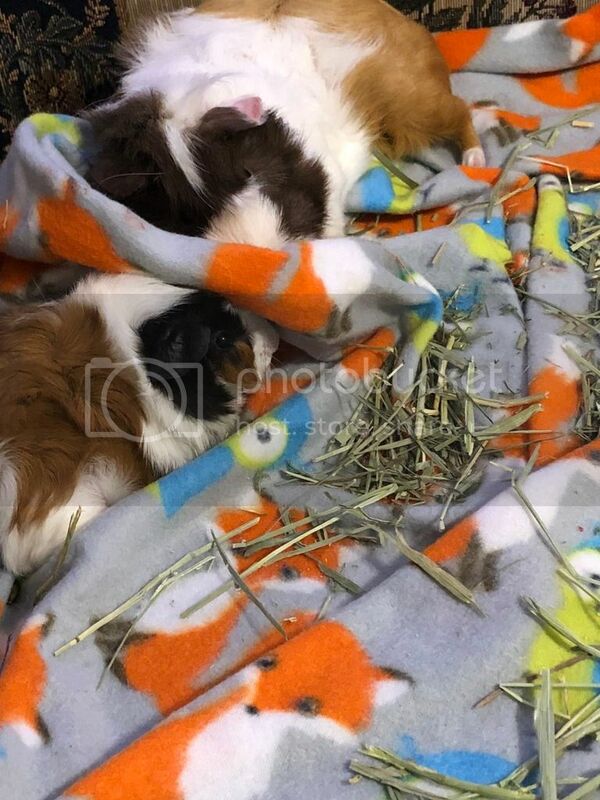 A good rescue takes much better care of their guinea pigs. I'm very sorry you lost Sophia. Don't beat yourself up over giving her medications, because as you said, she would have died without them anyway. At least she did have a few good days at the end. The one thing I would suggest next time you have to give antibiotics to any of them: about 60-90 minutes after administering the medication, give them a probiotic. Most of us use Bene Bac or the equivalent. Again, take comfort she had those good days. It sounds like she didn't have much of a chance anyway. Rest in peace, little Sophia. You are loved and missed. P.S. I found pet stores, big box or little family owned, refuse to admit their animals have anything contagious. My very first pig I bought from a small family owned store - it turned out he had lice and by the time I discovered it I had 3 infected guinea pigs. It took me months to get rid of the lice. The last two, I bought from a different mom and pop store. They seemed to care a bit more about the pigs than the first place so I thought I was safe. Nope, fungal infections on both, even though they were from different litters. Housed together of course! At least they didn't outright deny the fungus and I think (THINK) they did treat at least the ones showing obvious signs of infection. I wish Arkansas had a rescue. There's one unofficial one operated out of a woman's home here in Arkansas that I just learned about. I actually found out about her because not only does she run the rescue but she also clips nails, does health-checks, and can even treat them for free for mites and such! And she seems more knowledgeable about guinea pigs than most of our vets. However, due to the...situation in which she's running it (out of her home in the middle of a suburban neighborhood), she's had a lot of problems, such as animal control being called on her. No good deed goes unpunished I suppose. Thank you GrannyJu. We gave her a probiotic while she was on antibiotics and for a bit after we stopped them for good measure, but I guess her little system was just too weak to overcome it. The vet says the necropsy should be done by Friday to confirm what happened. I'm so sorry to hear you went through that! At least they didn't deny it and hopefully treated some of them. I feel as if some of the mom and pop stores care slightly more than the box stores, but it's still just income for most of them. I'd love to see more rescues opening up with people who actually care running them. Oh I feel like that would probably the hardest part! The woman who runs the rescue talks about people who adopt them then dump them back there because they're unwanted or they cannot take care of them. I don't know if seeing that kind of lack of caring and commitment would be hardest part or giving them up in the first place. There's several piggies there that she and her husband have claimed for themselves and would never give away, so I think she has a bit of the same problem! I can't imagine how hard it would be to not get overly attached to every single one. Hi everyone! This is Maggie. Mom's too sad to type, so I took over! We had a really rough week last week. My best friend, Sofia, died on Sunday night/early Monday morning I was very sad and moody. On Wednesday, I was in quite the mood, and I picked a fight with one of my sisters! Luckily, Mom was there to stop us, but I got a very bad bite to the face. After two vet trips, I ended up having to get my face shaved, a shot, AND a stitch in my face on Friday! I wasn't a happy camper, but I was a good girl and didn't bite a single person. The nurse at the vet had a son who gave me lots of cuddles afterward, so it wasn't too awful. I even got to stay at Mom's work for the rest of the afternoon! After we got home from work Friday afternoon, Mom got a phone call. I knew something was wrong, because Mom was crying really hard. From what we piggies could here, Mom's house dog, who has been staying with her grandparent's since she left for college, was hit by this thing called a car, and she died. Since Mom's had her for 7 years, she was pretty distraught. We cuddled with her all night to try to cheer her up. Cute! But I'm very sorry about the other losses. I am sorry about your dog. Maggie is looking much better. Maggie, it sounds like you take good care of mom, in spite of her being mean with the betadine. Soon the hair will grow back and you won't even know you have a battle scar! All 3 of you deserve medals. I'm so sorry about Lilly! Rest in peace, sweetie. You are loved and missed. The loss of so many critters has made things a bit of a rough go. 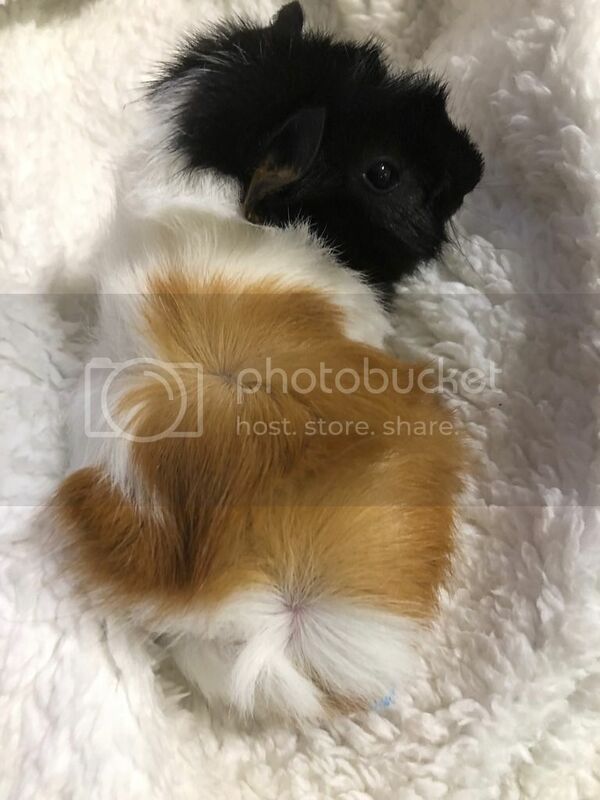 On August 1st, I was asked if I could foster two very young piggies until they could find a forever home. I declined, as there had simply been too much loss to handle the idea of taking two new girls in on top of everything. However, I told her that if in a week she still needed someone to help take care of them, I would consider it. A few days ago, before the week was up, I received the phone call again. She was taking care of far too many and needed the help quickly. I told her I would take care of them on a very temporary basis while until she could make other arrangements. Tuesday, I realized one of the girls was not eating or drinking. She was so weak she was barely walking. Of course, we made a mad rush to the vet. 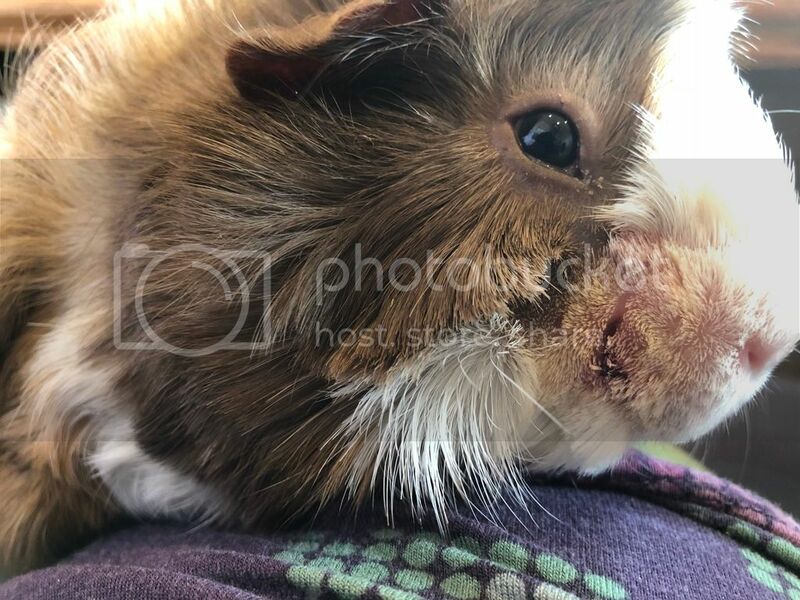 Well, as it turns out...one of the girls is completely blind (at this rate, I'll be learning far more about guinea pig ailments than I ever imagined). As she had been staying in the same place with the same food and water arrangments since birth, it had gone unnoticed. A change in the brand of food, having a water bottle instead of a bowl, new environment, etc., had been too much change for her to cope well. Her other Mom brought some of the pellets she had been using, we got her a bowl to drink from, and she is now doing just fine! The precious blind one has since been named Remy and her rambunctious sister, Rory. While their stay with me is temporary, it has been a bit joyous having two young ones in the house. While Maggie gets a bit territorial during floor time at first, she is simply infatuated with them. She never had babies of her own, and she has taken to caring for them. Both Maggie and Rory bring Remy food as if they realize she's struggling with being in a new environment with no eyesight. 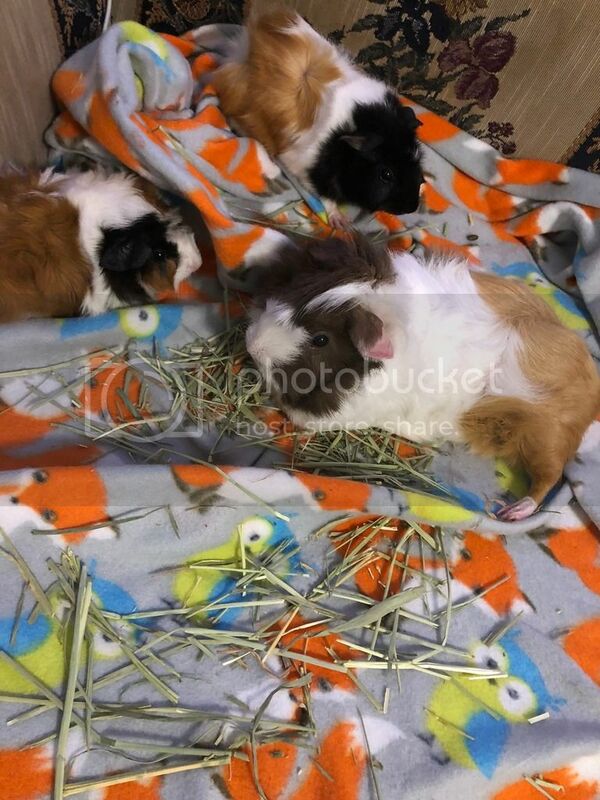 Maggie brings her bits of hay during floor time, and Rory brings her lettuce and other goodies in their cage. It is certainly quite heartwarming to see. I think it has done Maggie a world of good to get to play with the babies for a bit. Until they find forever homes, it will be quite lovely to watch. Remy, the day I brought her home. Rory cuddling on the blanket during lap time...she's something else, but she loves her photo being taken. Maggie and Remy...Maggie says that playing and eating hay is hard work! Wow, they are all so cute! This is Remy; Mom's transcribing for me since I can't see the keys! We've had quite the change around the house in the past week. Mom's grandparents, the ones who lost their beloved dog not long ago, have been terribly lonely. They can't bear to have another dog in the house at their house right now, but they seem to feel it's too empty. They visited again last weekend and fell in love with us (especially me, because I'm too cute to resist!!!) They begged to take Maggie home, but Mom couldn't bear to separate Maggie and I just yet...I've grown too fond of my adoptive piggy mom. However, she did finally concede that if they truly needed company, they could have the boys stay with them until they're once again ready to get a puppy (boys are stinky anyhow, so I don't mind much!) Mom misses them terribly, but she still gets to visit them every weekend or two. Her grandparents seemed to have come alive for the first time since the passing of their dog...I guess a little furry company is all they needed (seriously though, who couldn't cheer up with furry piggy cuddles???). I have been doing much better, and I'm now sharing a HUGE cage with Rory and Maggie. I still haven't figured out that stinkin' water bottle, but why should I bother learning when Mom puts out a special water bowl thats just for me??? I'm obviously not spoiled in the slightest. I have also found out that my favorite food in the entire world is grapes. Mom only gives them to me as treats for being extra good, or for when I attempt to use the water bottle. Then she laughs at me for having grape juice run down my mouth for the next few minutes, because I am a very messy eater. Overall, we're all getting very spoiled. The boys were being cuddled like crazy when we visited today; her grandma has taken to Owen and her grandpa to Derek. While they were meant to be more of a temporary emotional support, Mom's afraid she'll have to fight to get them back, even when they decide on a puppy! As much as she misses them, she is glad that both her grandparents and the boys are getting all the cuddles they can handle. Mom said it's far too late and all the good piggies are in bed, so I suppose I should go. Thank you everyone for your support in our adventures! Last edited by GreysGuineaPigs on Sat Aug 18, 2018 2:57 am, edited 1 time in total. Before we go to bed, Maggie is being vain and is insisting we post a picture of her (finally!) healed face. The fur has yet to grow back completely, but it looks sooooo much better.